As an academic powerhouse on water purification, Hokkaido University focused on the challenge of water pollution in the first half of GiFT 2013. The second half covered unique social issues in Japan in anticipation of the establishment of the Modern Japanese Study Program for undergraduate international students in 2014. 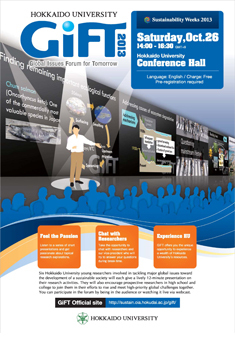 On October 26th, 2013, six young researchers of Hokkaido University presented the fruits of their studies and encouraged high school and college students to join them in their efforts to realize a better future. An audience of over a hundred gathered at a lecture hall on campus as well as on the internet. People from all over the world, including from Japan, the Philippines and the USA utilized the forum online. The moderator of GiFT 2013 picked up some challenging questions sent via Twitter, and the presenters enjoyed answering them during the live webcast. The video archive received 989 views in a month.